Travel deep into one of the world’s most pristine and remote wilderness areas, the Kimberley, and marvel at the extraorindary contrasts of Cable Beach in Broome. Travel deep into one of the world’s most pristine and remote wilderness areas, the Kimberley of Western Australia, where spectacular gorges, rugged ranges, cascading waterfalls and endless beaches define the landscape. Be spoiled by the warm outback hospitality at El Questro Homestead and marvel at the contrasting white sand and turquoise sea from your luxury hideaway, Cable Beach Club. Arrive into Kununurra, gateway to the East Kimberley, and relax before your outback adventure begins tomorrow. Hit the road this morning for the drive west to El Questro Station, an extraordinary 700,000-acre property nestled amidst the ancient Kimberley landscape. From your unique lodgings in the homestead, perched on ochre cliffs above the Chamberlain River, soak up views of the distant ranges and bask in the solitude. Head out on foot this afternoon for a guided walk before a three-course dinner under the stars. Immerse yourself in the myriad natural wonders of El Questro with an extensive choice of outdoor activities. Hike through tropical vegetation to Zebedee Springs, a series of thermal pools and small waterfalls set against a backdrop of sheer cliffs and Livistona palms. Take a 4WD safari through the property learning about the native flora and fauna, visiting the ancient boab trees and hearing stories from local characters about the area’s pastoral pioneers. Or cruise at dusk through the Chamberlain Gorge keeping eyes peeled for rock wallabies and crocodiles breathing in the changing colours of the landscape. 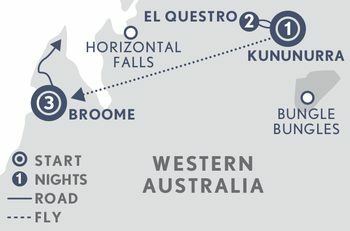 Return to Kununurra and connect with your flight* to Broome, pearling capital of Australia. After settling into your resort, set in lush tropical gardens just steps away from magnificent Cable Beach, hop aboard your camel for an unforgettable sunset ride along the beach. Later this evening, perhaps you’ll be lucky enough to witness the ‘Staircase to the Moon’, an incredible natural lightshow visible on just a few days each month when the full moon rises over the exposed tidal flats. Step inside Broome’s pearling industry on a visit to the Willie Creek Pearl Farm. Discover the process of modern cultured pearl farming, from shell to showroom, and understand what makes the perfect pearl. Cruise Willie Creek’s azure waters and view live oysters suspended in their natural environment amongst native flora and fauna and admire the finished article in eye-catching pieces of jewellery. A day to relax on the beach or in the resort. Or, take a scenic flight over the extraordinary Bungle Bungle Ranges or Horizontal Waterfalls (additional cost). Your journey ends as you depart Broome.